A huge thank you to those who shared their knitting stories a few weeks ago. Your stories – and the connections they represent – are inspiring and I believe they enrich us all. Thank you! The stories coincided with a giveaway for a skein of the amazing Malabrigo Arroyo yarn. This is truly one of my favorite yarns to work with. I can always rely on it to work up beautifully. 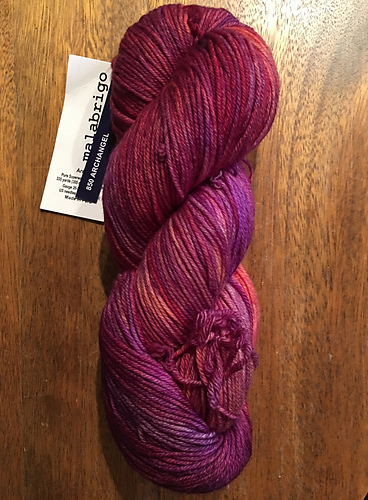 And Malabrigo has an amazing way with color. Congratulations to our winner, stairwayheaven! She chose this lovely colorway, Archangel. Thank you everyone for playing along with this giveaway. Any time that you want to share your knitting story with me, I would love to hear it. And stay tuned here (and in the Ravelry Knit Equals Joy group) for upcoming giveaways!